I am seriously obsessed with this thing called banh mi. I will take it any form, variation or combination. I’ve made a banh mi chicken salad. I’ve made “traditional” banh mi sandwiches with leftover sweet chili pork tenderloin and French baguettes. I’ve ordered burgers at restaurants. I’m on a mission to banh mi life. 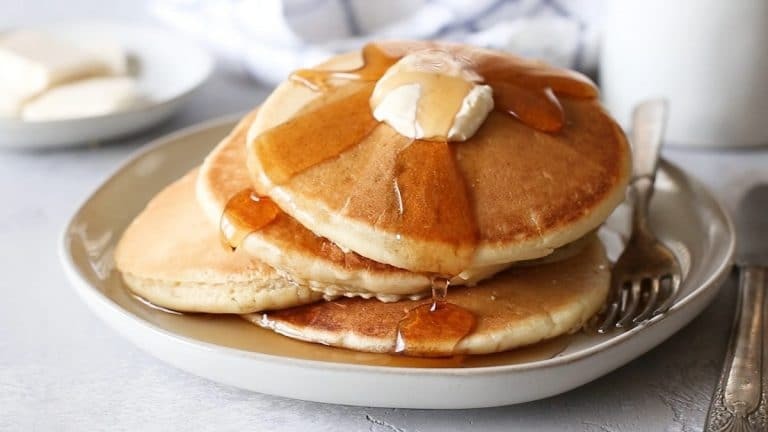 I’m wondering if I could create some sort of breakfast sandwich inspired by the flavors. It’s just so good, and I can’t help myself. 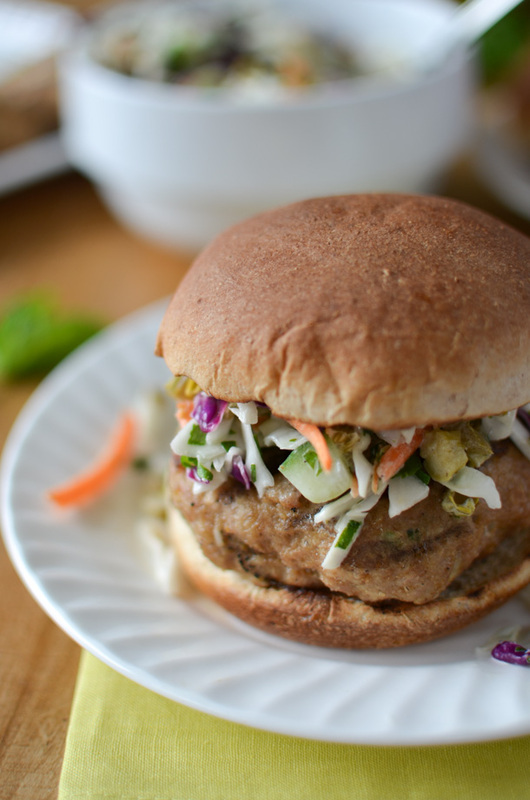 This time, I’ve made a banh mi turkey burger. While banh mi is traditionally topped with jalapeños, pickled carrots and herbs like cilantro and mint, I went with a coleslaw topping that includes and highlights all of these flavors. You don’t even need to do any actual pickling, which can take some of the fun out of the whole banh mi making process because it means you have to actually think things out ahead of time and make plans. I don’t want to make plans. I just want to have banh mi. 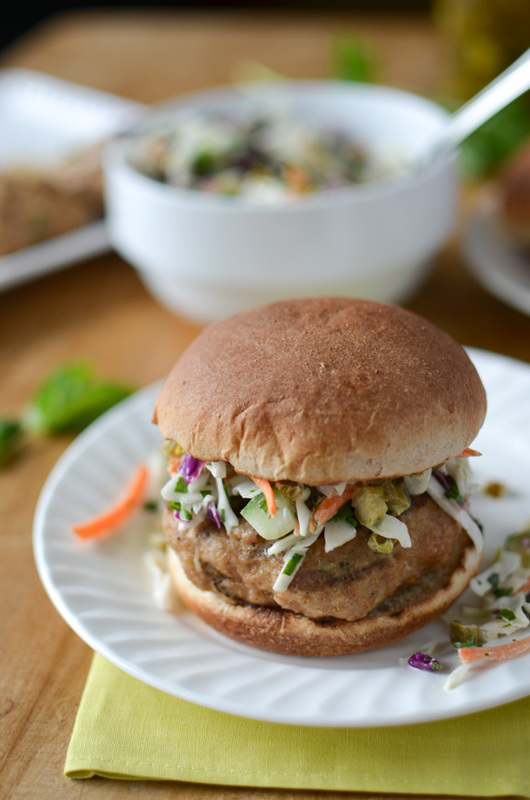 And, I don’t want to feel guilty doing it, which means light, whole-wheat burger buns and a really small amount of mayo in the coleslaw. 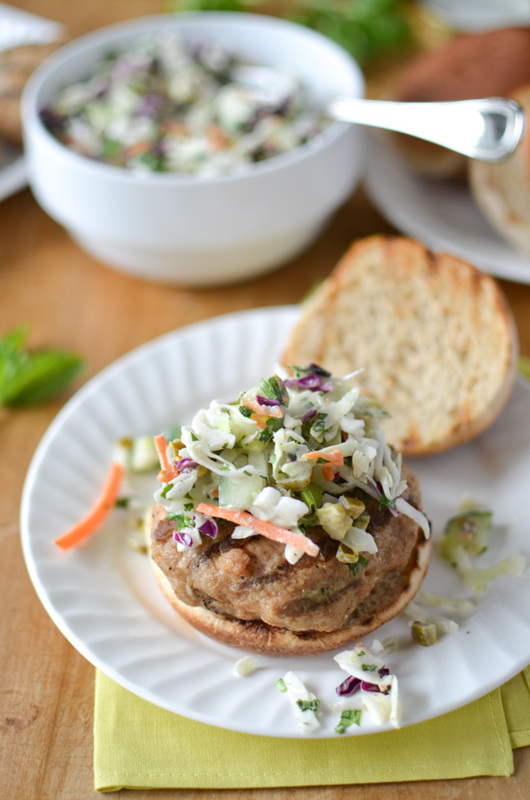 I’ve added a little extra flavor to the burgers with some green onion, garlic and ginger. Plus, the egg/breadcrumbs in the mixture keep the really lean turkey meat in the burgers nice and juicy. Just a quick tip/note: It may seem like there’s a really high amount of pickled jalapeños, but they’re a little less spicy than their fresh counterparts. The recipe does bring a little heat, but you can easily adjust the amount to match your personal preferences. Preheat a grill to medium-indirect heat (375˚F – 400˚F). In a medium bowl, stir together the coleslaw ingredients. Set aside. In a large bowl, mix together the burger ingredients until evenly combined. Form the mixture into 4 patties. Grill burgers for about 6 – 7 minutes per side, or until burgers have reached an internal temperature of 165˚F and juices run clear. 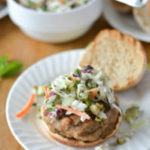 To serve, place burger patties on buns and top with coleslaw. Eager to try this recipe. Easy and simple. So, I’ve never actually had anything banh mi flavored, but I always think that it would taste so good!! 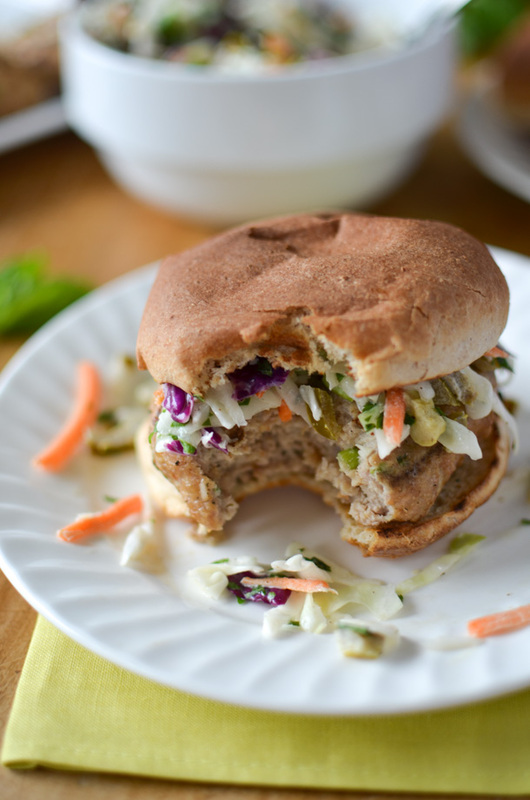 These turkey burgers look like the perfect way to get your banh mi fix! This looks delicious and I can’t wait to try it! I am doing a clean eating plan right now and this looks pretty clean 🙂 Do you think I could sub Greek yogurt for the mayo without sacrificing the taste too much? Yes I definitely think you can! It shouldn’t taste much different at all. It’s really only in there for the creaminess.